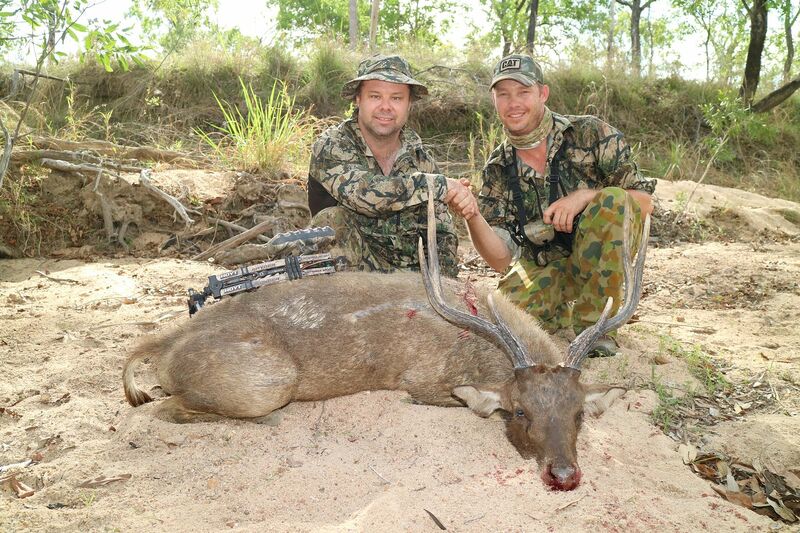 Just about to board the plane from Sydney to the Gold Coast in late September 2017 for a family holiday when a good mate from my home town of Cobar Luke Dickson who now resides in Weipa Cape York contacted me and offered me a chance to hunt Moluccan Rusa. I believed I had a few brownie points clocked up with the minister for war and finance and got the ok to book some flights in early November for the impending trip. With an approaching trip to Namibia in mid-2018 I went about investigating a bow travel case and the sourcing details on what items I need to declare etc. and the rules on what I was aloud to take and not take on flights. With all the intel complete I decided on the Easton double roller bow case as it ticked all the boxes I required and it will be an investment for future trips. The travel arrangements were made with a 3-hour drive to Dubbo after my weeks work, then staying the night there before a flight to Sydney the next morning for a two-hour layover before another flight up to Cairns in Queensland with another two-hour layover before boarding the final plane to Weipa where Luke was to pick me up. We then had a day to get some supply’s and fuel before setting out on a 7-hour drive out to the property. 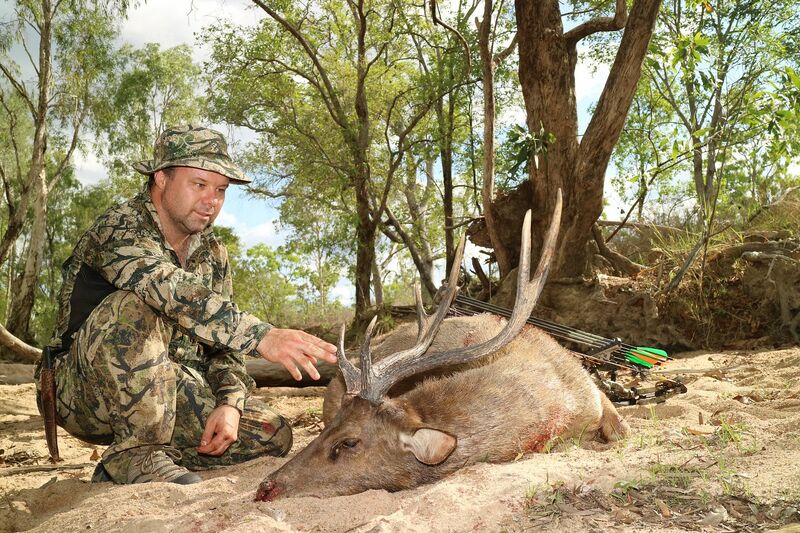 All the time traveling and waiting I couldn’t care less as I was embarking on another adventure hunt to one of the most beautiful places on earth with a chance at hunting some great country and another species of deer that call Australia home. 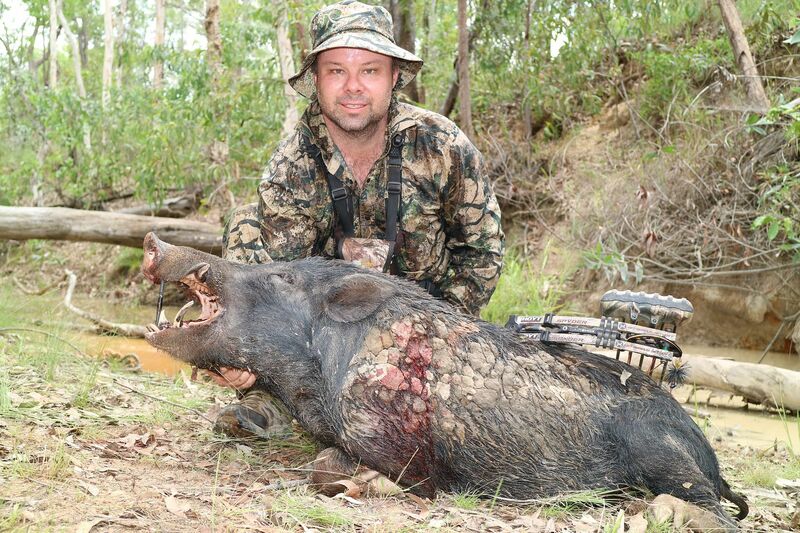 Not to mention a chance at some big cape boars that frequent such places in Cape York. Arriving at the property, Luke took me to meet the owners who had lived on the place for 50 years. I found them true honest bushies much like the cockies down my way, hard working and to the point with no mucking about, you wouldn’t find better people anywhere and I certainly enjoyed Phil’s company when he came down to share a frothy or two at the end of a day’s hunt. 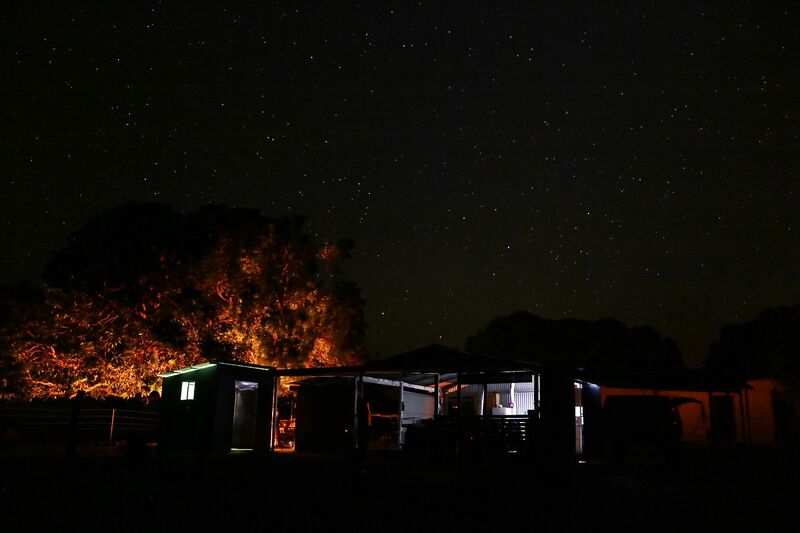 After settling into camp of which you have two choices, one being the old original homestead with power, gas hot water and all the amenities with a view to die for of the surrounding country and picturesque lake. The other accommodation was some dongas with no power and a kitchen/dining area and shower block that had power and all the amenities as well but used a donkey for hot water. It too was a magnificent spot overlooking the original house dam on the property and was where we opted to stay. Everywhere you looked you could see deer out feeding and resting and some even swimming out to feed on the abundant lilies in the water. With not much light left and with my minimal experience hunting deer I geared up and proceeded to have a little sneak near camp on some deer to get a gauge of what they are like, their alarm call and how they react as I was sure to spook them in the end. 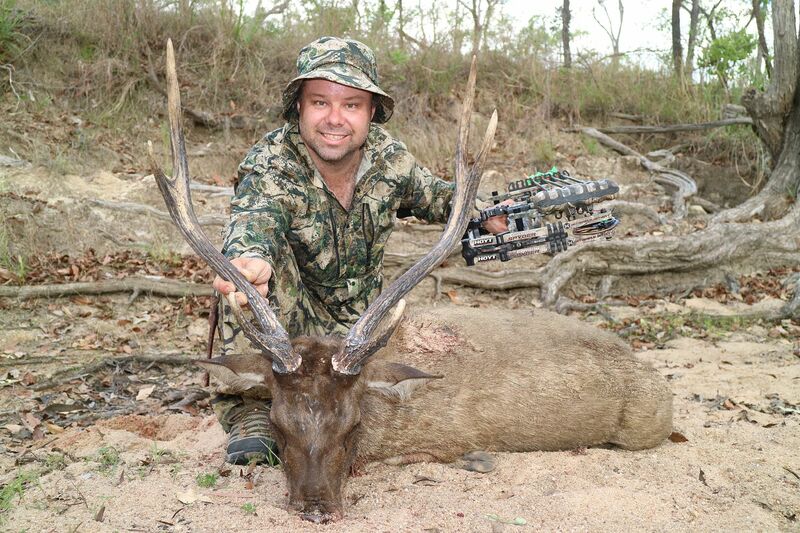 It sure was evident that I would need to be at my best to get in close to these wary critters but I did have an ace up my sleeve in Luke who is quite an accomplished bowhunter himself taking numerous species of deer including mollucan as well as many other larger game animals we have in Australia. He surely was an asset with his knowledge of the deer and of the property in where the best areas were to find and get into bow range of them. After a good night’s sleep, we got up early and had some brekky before setting out on a hunt around the lake and a few creeks and gullies that lead into it. I say lake as it is pretty big with approximately 8 kilometers to circumnavigate it. It has many tributaries and creeks that flow into it leaving many hidey holes and peninsulas for the deer to hide in and feed around. 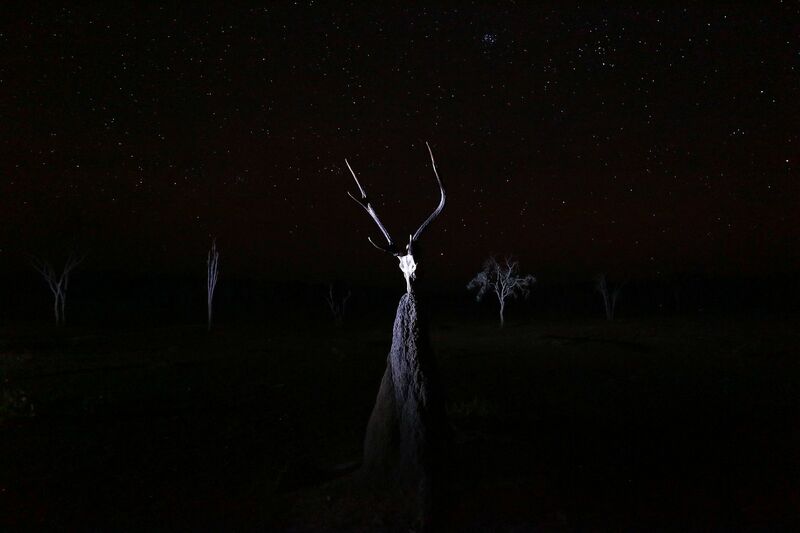 It did not take long to find a small herd with around half a dozen does and yearlings and two stags resting up on the side of a gully in some slightly open country giving them a good field of view. They were about 120 meters as the crow flies from me but as I was on the same level as them on the opposite side of a gully. So, I had to sneak down to the creek bottom and then hopefully up onto them. It was warming up and they were content on staying put, from the day before I knew I had to take my time so I crawled as far as I dared very slowly before getting a big belly full of water and ditching my pack for Luke to grab as suggested. I had some country to navigate and had to belly crawl glacially as I had some open sections to cross which would hopefully line me up with a termite mound and allow me to get into range. I’m not sure how long it took but I managed to make it to the mound with only a minor hiccup in some birds noticing the snake like figure on the ground. I just dared not look and just lied there on the ground for a good 15 minutes or more until everything settled back to normal. Soon enough I was at the mound which turned into two small ones about 38 meters from the bedded stags. Being here it allowed me to squat or kneel in seclusion and glass and range some items, it opened out from here up to the deer with some does facing my direction stopping me from advancing. The stags offered no shot and as time went by slowly then a slight tickle on the back of my neck and the inevitable came shortly after as the deer all got to their feet and filed out. Disappointed but so elated to have gotten into range on my first real stalk at a stag. We went back to camp and had some lunch and cold refreshments. There’s a big clearing to the south of the dam that the deer like to feed on and then they will filter down thru some timber towards the lake for a drink or in some stag’s cases a wallow. 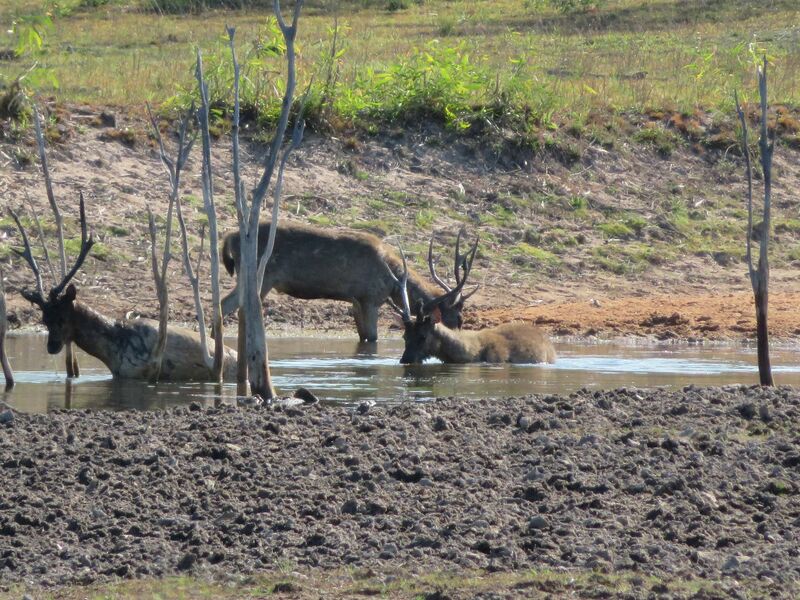 It was pretty hot and one such stag who may have had a late night chasing all the girls around decided he needed a cool off and ventured down the main lake only a couple hundred meters from our location. I once again got a big belly of water and my bow and stepped out into the heat with a great wind in my face. 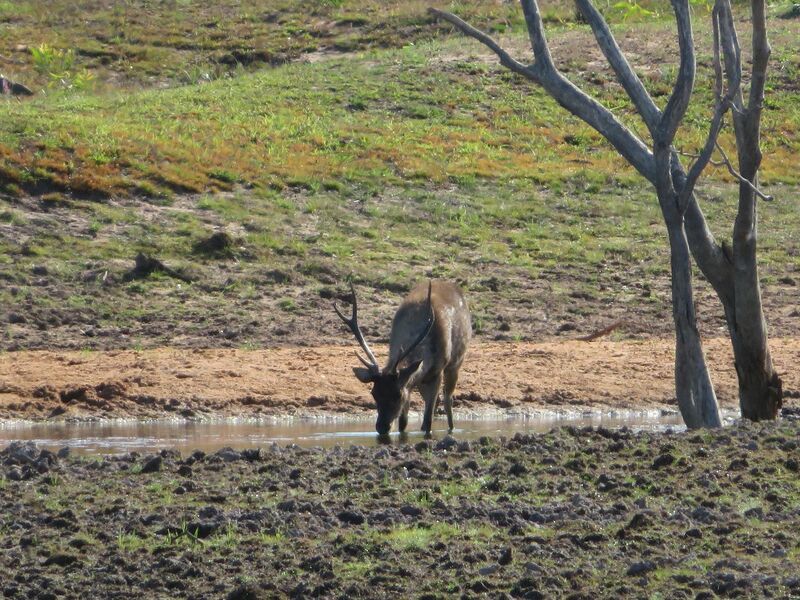 The stag was on the main lake at a small tributary that led into it glassing his surrounds. I was around two hundred meters out and slowly closed into around 120 odd meters using some trees as cover as I was down at the water’s edge of the original dam. At this stage some plovers right in the middle of us took flight and alarmed the stag who was quite impressive of around 29-30 inches. He glared in my direction for an eternity before setting down. I believed my best option now was to get the shoes off and step into the water and get down low and approach the eastern dam bank of the original dam. There were definitely some freshies about and a salty has not been seen for a long time I was assured but you still never know. So here I am sneaking along in the water up just above my waist getting closer with each step but growing some eyes in the back of my head as I progress for obvious reasons. Eventually I get to the eastern edge and can stand up on the waters edge and glass under a fallen log towards the now bedded stag which I’ve ranged at 50 meters, but his facing my direction. Not wanting a shot this far I just wait and glass and wait some more. I soon decide with the good head wind to try and circle around to the right using the dam bank as cover. To do this I get back onto the water to get lower and put on a great sneak exiting the water and then crawling an additional 40 odd meters around to be approximately broadside from the stag and he sure is a beauty. The problem was he was bedded and I believe even if I stood I still would not get a shot at his vitals as all I could see was the tops of his inners up, I was about 23 Meters from him, out of cover and close enough for him to hear and would be easily silhouetted if I tried to stand, so I needed him to stand for a chance at a shot. I drew back a few times in anticipation of him standing when he was checking his surrounds, man my ticker was beating fast. After a long time waiting and then deciding to make things happen with drawing and making a doe call, I was just about to draw when the wind sucked back just a fraction and that stag got the fright of his life and erupted into a full gallop like Winx in the Caulfield cup. Absolutely gutted I was for it was a really good chance at an impressive buck. With no more luck that day we had a good feed and good nights rest for the next days assault on the mollucan. Some stags in the water bobbing for lily’s and frolicking about. This day was once again a beautiful Cape York morning with the gentle easterly blowing and local birdlife waking you up bright an early. We set out from camp as we could see some stags further up the lake. We closed in to around 200 meters before the cover became really scarce as they were feeding out on a peninsular. There were two groups of two stags about 100 meters apart. I put in a mammoth effort in belly crawling and closing the gap to around 70 meters to the last tree and bit of cover I had. Just waiting them out the two smaller stags in one group moved over to the two bigger stags. This was my chance I had hoped for with the four stags together and less area to cover their ever-vigilant eyes, but the two smaller ones only stayed for a few minutes before starting to depart which got the bigger lads on the hoof as well following. There wasn’t a breath of wind to drown out even the smallest whisper but as they the deer exited they caught the very smallest of scent wafting about and the game was up. It still was a good effort I was proud of. We then ventured back to camp and had a bite to eat for departing out to a creek with plenty of shade and cover to the west of camp. Just moseying along a track Luke spied a nice stag unawares a few hundred meters up on a small ridge. He looked like he was on a mission and trotted down to a clearing and appeared to be alone. A huge advantage as I would only have one set of eyes and ears to contend with. He went into some deep shadows by a creek and became hard to see and soon disappeared. The wind was good so I set out glacially to the last spot I seen him while Luke stayed put. There was ample leaf litter about due to some big gum trees so I picked the best route and slowly moved in taking my time. As I neared the last spot he was seen there was no sign at all. It looked like he may have entered the creek which had some steep banks. He did not go thru the creek as I would have seen him on the opposite bank as it was on the same elevation as me and he did not go up the creek as I to would have seen him with my view of the creek upstream. That left that he either went down the creek once he entered as my view was obscured or he was still in the creek and may have bedded as it was after lunch and warming up considerably. Either way I did not know so took my time glassing and treading my feet carefully. 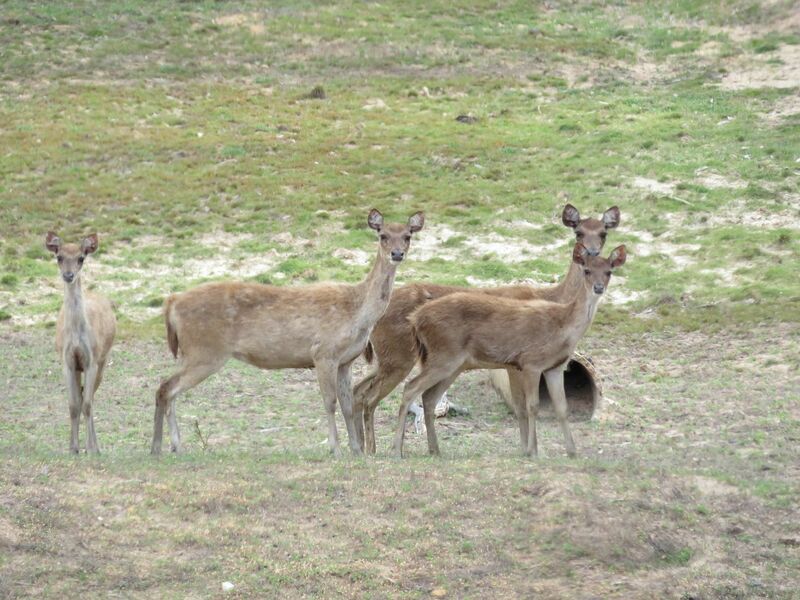 I then noticed about 20 meters in front of me a trampled down area in the grass similar to what heard fallow deer do, like a rutting pad. Once again, my movements were methodical and precise as I moved over to this area and glassed. 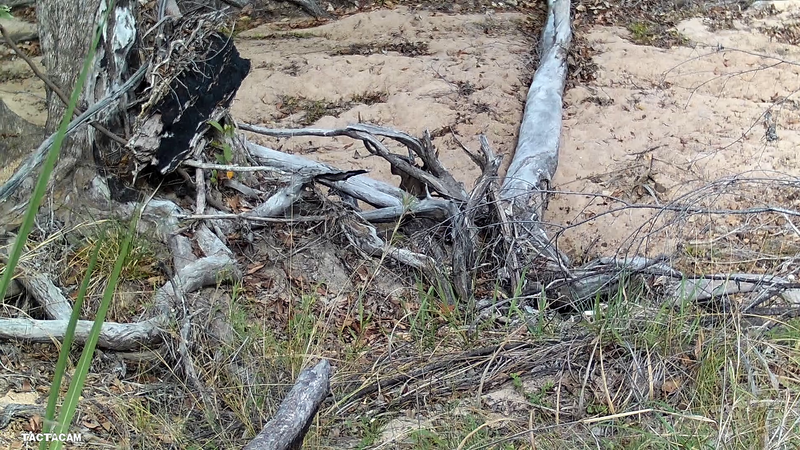 Still nothing, I then spy an entry into the creek and assume that is where the stag may have entered the creek. I ever so slowly move towards it and stop. I don’t know why I stopped I just sensed something and felt the hairs on the back of my neck stand up, but not from the wind. All of a sudden, I catch movement in my peripheral vision down to my left. 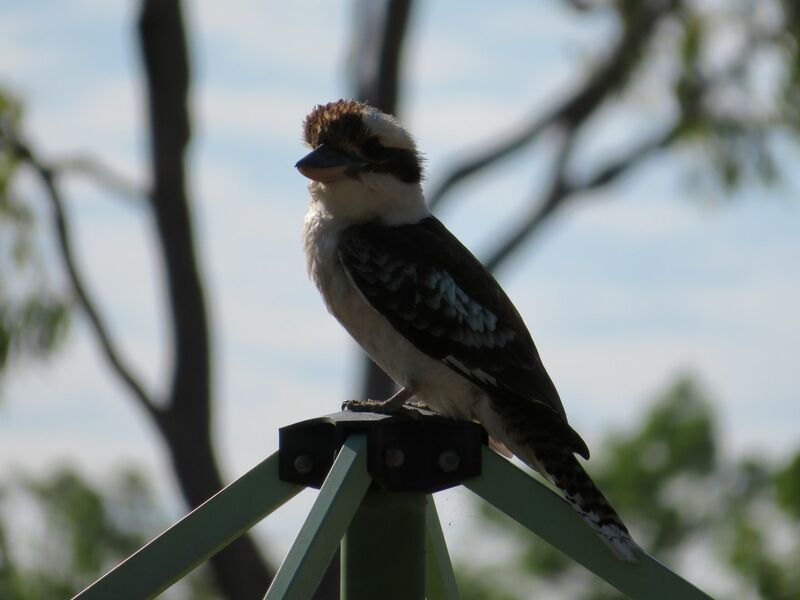 There he is only 11 meters from bedded down under some fallen logs under a big gum tree. Holy hell my heart near leapt out of my chest as it quickened and the excitement grew. It sure does pay to take your time and move quietly thru the brush. I’m well with in range but all I could see was his antlers and his head as he moved from side to side luckily facing away from me although his vision was obscured by the logs. The sun was beating down and he was attuned to any abnormal noise. It was like I hardly wanted to breath in case he heard me. I ranged him and numerous items within the area if he decided to move and just waited…..and waited. And waited some more. I thought back to my earlier chance the day before and decided that I would make things happen. I glassed the stag one last time and spied an opening that looked like it may lead into his vitals. It was about from my angle a 3-inch diamond shaped opening but leaning towards the left. I practice at all distances and even though I have a 20-meter pin, I know at 10 meters I need to put that 20M pin 2-inches lower than my desired point of impact. Now this is where real practice helps to work such things out but it sure can play tricks on your mindset when you need to put that pin on a six-inch log and trigger the release. I know I can put the arrow exactly where I want so go about getting it done. I’m at 11 meters but think a slightly closer shot will pay dividends with a better angle for the shot. I pick my route to get closer as my heart beats oh so fast, I draw back first with the ever reliable 175gn VPA penetrator up front and take two long steps which opens up the window even better. I’m shooting down on a 40-degree angle so I bend slightly at the hips and set my bubble perfectly. The hunt seems to stand still as I hold the pin steady and clip off my release. 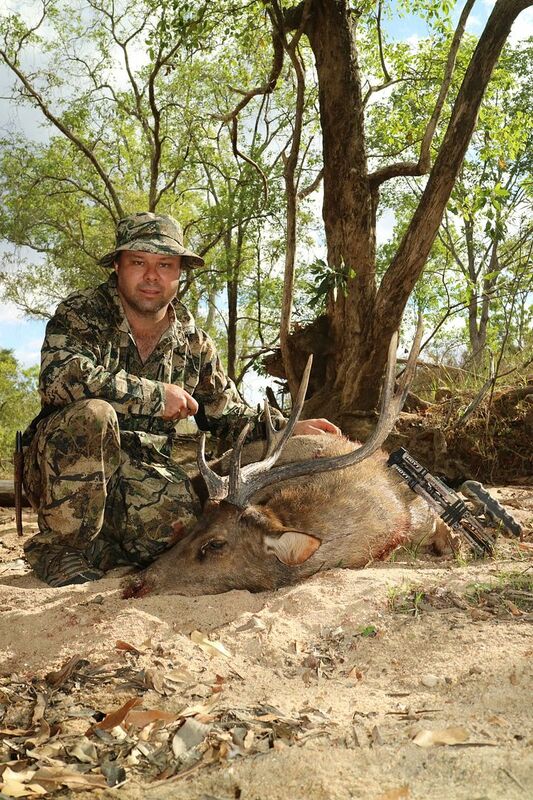 The Easton axis 260 threaded the needle with pin point accuracy exactly where I wanted, it was such a relief to see as it punched down thru the stag’s spine into the chest cavity digging into the sand below. He instantly collapsed on the spot and I loaded up another arrow and made sure we were not going to be tracking this fella very far. Overwhelmed and speechless come to mind as I can clearly see his down for the count. The shakes hit me like never before and I back out to give him time and piece. I was so elated to finally get it done after the monumental travel I’ve taken and then the effort to close the distance on these wary but beautiful creatures. I was so thankful for Luke who gave me the chance to hunt and guide me so I called for him as he was some distance off so we could go down together and check out my stag. I let nothing out of the bag as he came closer and asked me how I went. “STAG DOWN BROTHER” I replied and he was super exited and very happy for me. We high fived and went to check him out not as a guide but as mates. Me and the master guide Luke. That night was long one with a few celebratory drinks and caping and cleaning of the head and antlers. I was thankful for a bit of sleep in the following morning instead of the usual early start. Today was going to be a bit of a lay day and tidy up the cape and head some more and get some nice photos of the antlers and of the stars that night, my stag measured out roughly at 25 inches and later went trophy class at 153, super stoked. Once at the chores were done, we set out to find a hog to spear. Luke has a pretty good grasp on the property and selected a spring fed creek we could walk in the hope of finding a hog or two. We waited until it started to heat up and embarked on the hunt. I was clearly to see that many pigs frequented the area from the sign and it would not be long before we found one and then we did as the usual fickle wind gave us away and a big cracker big boar erupted from his bed to safer pastures. We expected to see pigs at every turn but the recent rains just before my arrival spread them out. 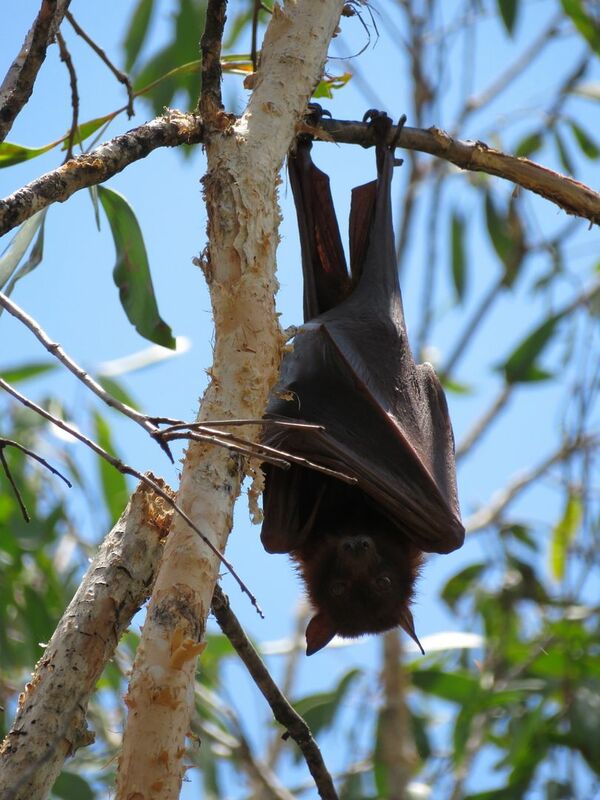 We were nearing the spring when could hear an almighty raucous that was a colony of fruit bats. We got some photos and a little video and then spied a few smaller pigs weaving in and out of the tall grass. 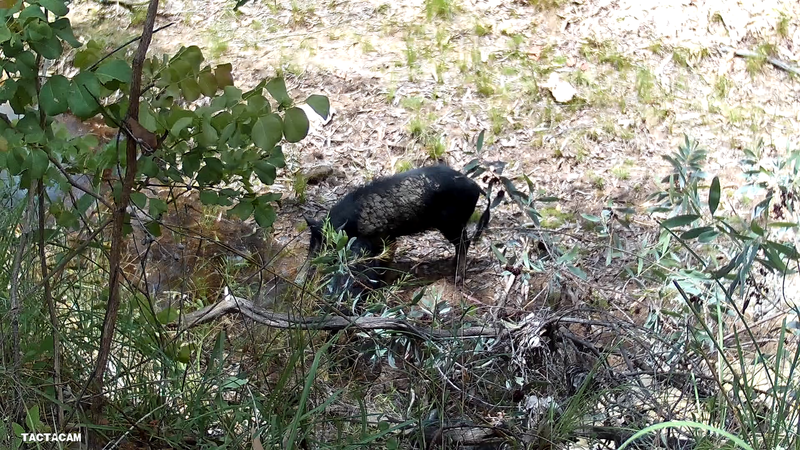 The spot looked a treat for swine so we headed back to the creek in the hope of finding them on the water. Once back at the creek Luke immediately spotted a small sow on the creek bottom feeding and a larger one on the bank asleep. Not knowing what the larger one was I opted to circle away from the creek around in on a good angle for the bedded hog hoping it was a boar. 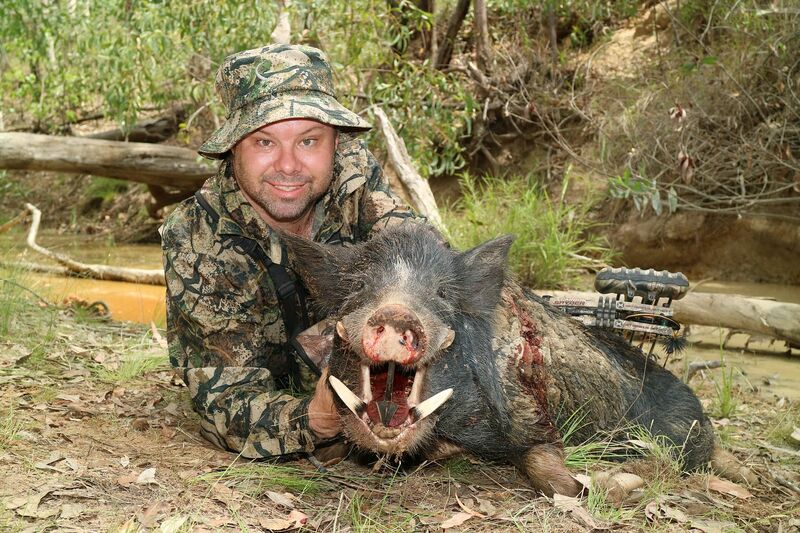 I easily got into 19 meters and glassed the hog to see it was a sow. I was just contemplating putting an arrow thru her when an even bigger boisterous and rowdy commotion took place just in front of me but below me in the creek. By the grunts and squeals it appeared like two boars were having a scrap over a sow and I confirmed this as I sneaked in a little closer to be about 7 meters above them. 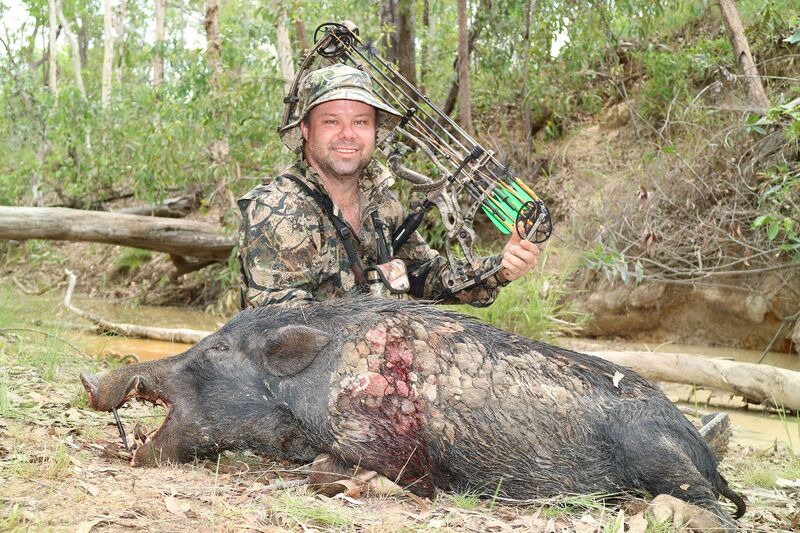 This time I was loaded up with a custom 175gn broadhead from Razor VPA and soon had the 80-pound Hoyt Spyder into anchor and was following the biggest boar around with my pin until he gave me a good angle down between his shoulder blades of which I promptly took. The boar let out a few grunts and circled around for the boar that he thought got him and soon fell over in the water not 4 meters from the impact zone, I was getting good with these east tracking jobs. I got a heap of photos and removed the jaw to be boiled out later. The boar ended up going trophy class at 27.5 inches. Luke as expected was expert in guiding me around on the moluccan and like me cut his teeth on hogs so he knows the ins and outs of them as well not to mention the property itself and where the game is to be found. The place is beautiful in every sense of the word and needs to be experienced by every avid bowhunter. I had a marvelous time even with all the travel and to get the drop on a pretty wary deer species and have several opportunities at others was truly exhilarating and to get a good boar was the icing on the cake for a great hunt with a great mate in great country. Can’t get better than that, thanks mate. 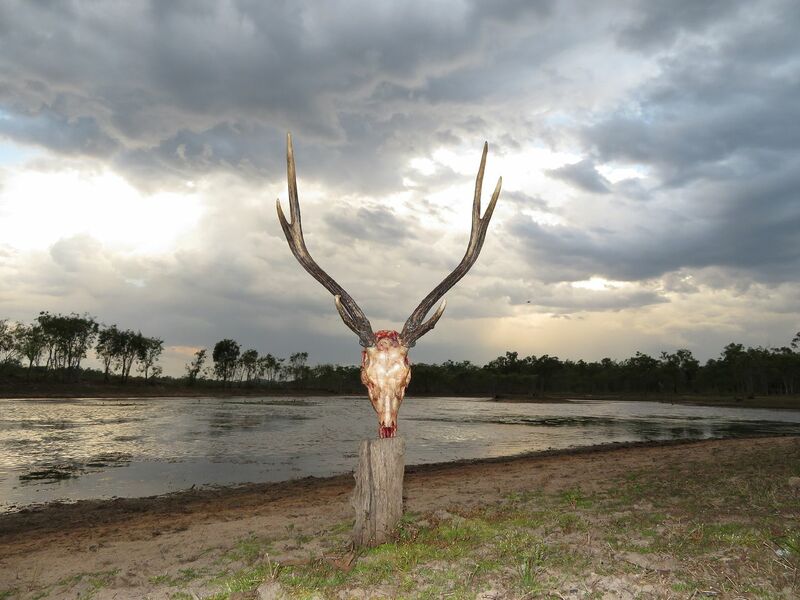 If you would like to hunt this magical place and at a very good price don’t hesitate to contact Luke at ldhuntingsafaris@gmail.com you wont regret it. Last edited by xlr8scotty; 22nd December 2018 at 03:33 PM. I might be biased for the old deer hunting but rekn this is one of my favourite stories from you. Great effort on those pics, those rusa up north don't carry the weight as the ones I've shot here in the rainforest. Your stories are appreciated it's just so difficult to post a comment. 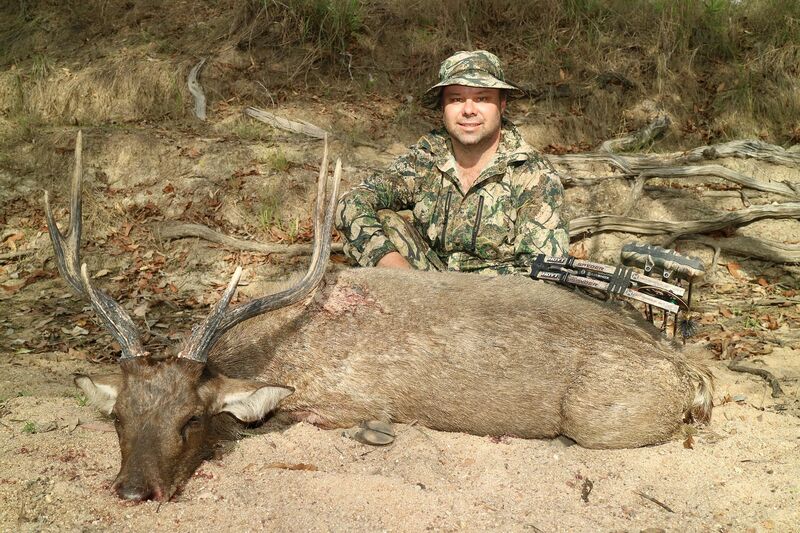 Great read Scotty, sounds like you worked hard for that Stag.